Get high yields and high purity EVs from urine—SBI’s Exo-Urine™ EV Isolation Kit overcomes the challenges of conventional EV isolation approaches. Overcome the yield and purity challenges of isolating EVs from urine with SBI’s Exo-Urine EV Isolation Kit. Designed to help EVs escape from the mesh of polymerized Tamm-Horstall protein (THP/uromodulin), a glycoprotein present in high amounts in urine, the Exo-Urine EV Isolation Kit combines size-exclusion chromatography (SEC) and proprietary solubilization reagents to deliver high yields of highly pure EVs. Starting with as little as 1.5 mL of freshly voided (<4 hrs from initial collection) or frozen urine preps, the Exo-Urine Kit delivers EV preps that are low in THP/uromodulin contamination, enabling faster, more efficient studies of EV-derived biomarkers from urine. Urinary-associated EVs (uEVs) are an excellent source of biomarkers for a host of kidney and genito-urinary disorders including acute kidney injury (AKI), urogenital cancer, chronic kidney diseases, glomerular diseases, renal allograft rejection, and unique tubulopathies1. Because collection is easy and non-invasive, urine is a popular alternative to serum or plasma as a starting material for biomarker discovery. However, technical challenges with EV isolation from urine have limited the power of conventional isolation methods. In particular, the presence of high amounts of THP, which can polymerize into an EV-trapping mesh, has made it difficult to obtain clean, high-concentration preps from urine. SBI’s Exo-Urine EV Isolation Kit overcomes these issues and opens the door to better, more efficient biomarker discovery from urine-derived EVs. * As assessed by western blotting for THP/uromodulin using equal volume loading. ** As assessed by normalized protein abundance using mass spectrometry. *** EV yields from either 1.5 mL of urine (processed using the Exo-Urine Kit) or 15 mL of urine (processed using ultracentrifugation or polymer precipitation) were measured using ZetaView NTA and fNTA. Huebner AR, et al. Exosomes in urine biomarker discovery. Adv Exp Med Biol. 2015; 845:43-58. PMID: 25355568. Figure 1. Using fresh urine samples, the Exo-Urine Kit delivers preps that are enriched for EV-associated markers—with more CD63 than a competitor’s kit—and are low in contaminating THP. Freshly collected urine samples from three healthy donors were pooled and stored for 2, 4, or 6 hrs at 4°C before EV isolation and analysis via Western blot. 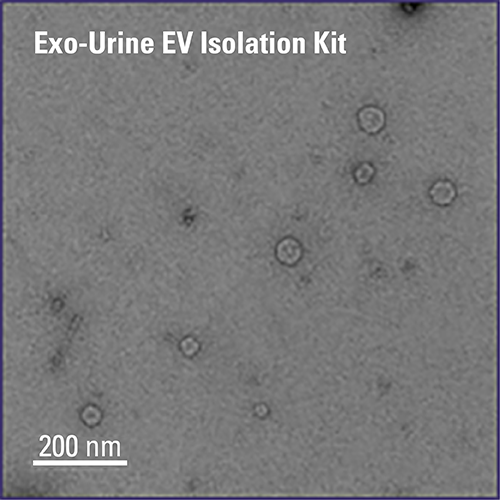 (A) EV preps isolated from these samples using the Exo-Urine EV Isolation Kit show higher levels of the exosome-specific marker CD63 than EV preps isolated using Company N’s kit, and both EV isolation methods contained low levels of contaminating THP. Note that only 1.5 mL of the pooled urine was used for EV isolation with the Exo-Urine Kit, whereas 15 mL of pooled urine was needed for EV isolation using Company N’s kit. (B) EVs prepared using the Exo-Urine Kit are also enriched for the EV markers AQP2, TSG101, and HSP70. Figure 2. Using frozen urine samples, the Exo-Urine Kit delivers EV preps that show greater enrichment of EV markers and less contaminating THP than other methods. Urine samples from healthy donors were pooled and stored at -20°C for 3 weeks before EV isolation and Western blotting for EV markers and contaminating THP. The superiority of the Exo-Urine Kit compared to other methods—Company N’s kit, ultracentrifugation, and polymer precipitation—is reflected in the higher levels of EV markers and almost complete lack of contaminating THP in the EVs isolated using the Exo-Urine Kit. As with Figure 1, only 1.5 mL of the pooled urine sample was used for the Exo-Urine prep compared to 15 mL for all other methods. High relative amounts of aquaporin-2 (AQP2) vs other EV markers in the ultracentrifugation and polymer precipitation lanes could result from carryover of non-EV associated forms of aquaporin-2 (Kodaka K, et al. Urinary Exosomal Aquaporin-2 Expression and the Efficacy of Tolvaptan in Advanced CKD Patients with Congestive Heart Failure: An Interim Report. J Clin Exp Nephrol. 2018 April. 3:6. DOI: 10.21767/2472-5056.100057). Figure 3. The Exo-Urine Kit delivers higher yields of EVs (protein equivalent) than other methods. EV preps from Figure 2 were analyzed for EV yield (as measured by protein equivalence using Qubit protein assay) and amounts normalized to the EVs isolated by ultracentrifugation. Use of the Exo-Urine Kit results in more EVs than all other methods. Figure 4. EVs isolated using the Exo-Urine Kit possess typical EV morphology and low levels of filaments. Transmission electron microscopy (TEM) of EVs isolated from urine using either the Exo-Urine Kit, Company N’s kit, ultracentrifugation, or polymer precipitation show that the EVs isolated using the Exo-Urine Kit have the typical EV morphology and relatively fewer THP filaments than the other methods. Figure 5. Mass spectrometry analysis of EVs isolated using the Exo-Urine Kit verify enrichment of EV markers and depletion of contaminating THP. LC-MS/MS analysis of the samples used in Figure 2 verify the Western blot analysis shown in Figure 2—EVs isolated using the Exo-Urine Kit show higher levels of EV markers, here Hsp70 and Anxa2—and lower levels of contaminating THP than EVs isolated using Company N’s kit, ultracentrifugation, or polymer precipitation.